Advanced Football Analytics (formerly Advanced NFL Stats): What Kind of Teams Are Super Bowl Winners? And here is the plot of only Super Bowl Champions. 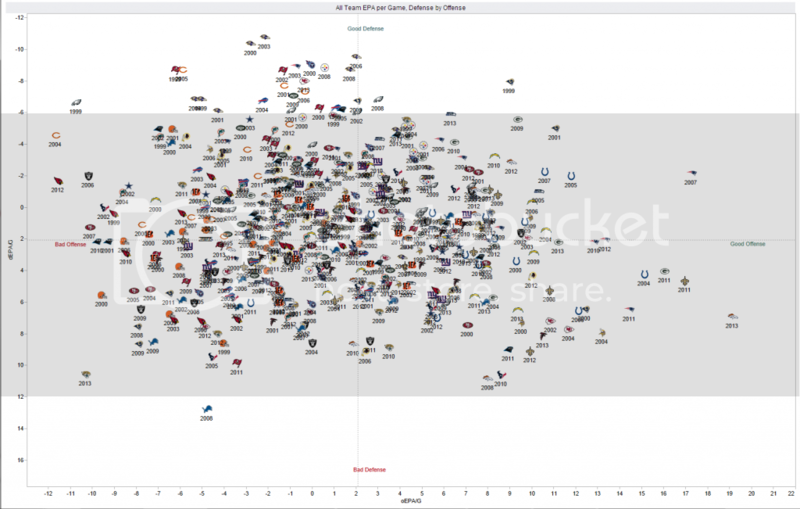 Note that of the 13 champions there are only 5 teams in the upper-right (good offense/good defense) quadrant. 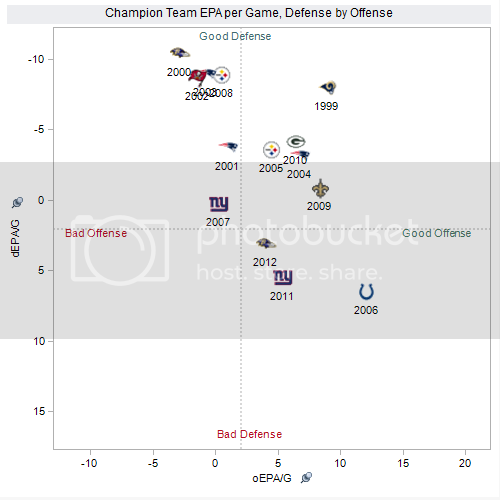 There are three teams in the lower-right (good offense/bad defense), and only one true elite offense/bad defense. The 2012 Ravens and 2011 Giants might be better classified as slightly above average teams with good fortune in the playoffs. We could throw the 2007 Giants and 2001 Patriots into that class too. There are 4 teams in the 'elite' defense/below average offense cluster in the top-left quadrant. That's nearly as many as the 5 all-around good/good teams. Despite what we know about the relative distributions of elite offenses and defenses, recent champions tend to skew toward solid defense. Of course, we're only looking at a sample of 13 seasons, so we can't draw conclusions. And just because a team is 'within-zone' doesn't mean its of winning it all is equal to a dominant 'upper-right' team. But one thing that stands out is there are no champions from the lower-left quadrant--below average on both sides of the ball. 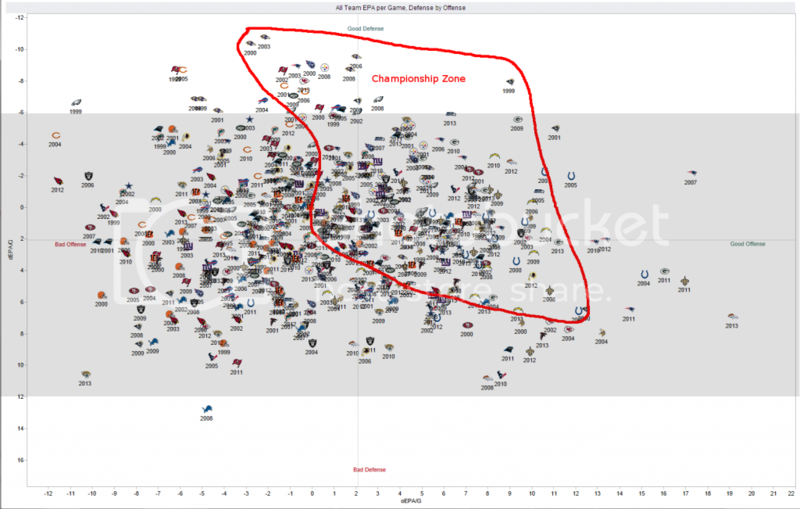 The most interesting is that the championship zone comprises the majority of teams. Only 12 will be both good enough and lucky enough to make the playoffs, but until then most teams are legitimate contenders. That's one of the reasons we keep showing up or tuning in every Sunday. Could some of this result be an artifact that offenses have become more efficient on average over the last decade or so? Just eyeballing the graph, it seems like teams in the "good offense" quadrants disproportionately come from more recent years, "good defense" teams tend to come from earlier years in the sample. I wonder if the result would hold up if you adjusted for this by plotting the teams' EPA relative to the league average EPA for that season. This website is so stupid. Those Giants teams and last year's Ravens have to be the worst teams ever to win the Super Bowl. Other Anon - The graph is actually saying that they are the worst teams to win it in the years examined. I was the second anon. First anon must be a Saints fan. Whoops I meant I was the third Anon, and the fourth must be a Saints fan. I think it's intriguing because this is terrific evidence which supports the old saw "defense wins championships". Very few of these teams have below average defenses. It's also interesting that none come from the lower left quadrant - which you'd hope would be the case. That would completely undermine the NFL's drive for parity if truly bad teams won. 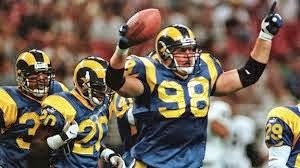 That said, it's sad that even a few mediocre teams won because they found 'good fortune' come playoff time, especially if they backed into the playoffs (as some did).